If you are looking for a fountain pen that is an example of simple elegance and masculine grace, the Waterman Expert is an ideal option at an affordable price. The Waterman Expert has a simple, classic design that is sophisticated by small details.The body is made of a rich black high quality lacquer and has a rounded cigar shape. The cap has a sleek design with a stylish slanted head and reliable steel clip, with the Waterman logo. The cap also snaps securely when posted. The body has a light to medium weight and when posted has a medium that is substantial without feeling top heavy. The grip is slightly thinner than the rest of the body and shaped to give one’s fingers a firm hold, while the pen rests gently in one’s hand. 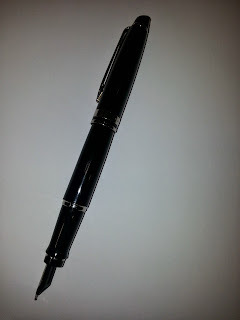 The writing experience of the Waterman Expert is a pleasure at a fair price. The pen has a very smooth nib for a steel piece. With the medium nib, some light pressure is needed to get started, yet once it does it flows evenly and with little effort. The gold quality performance is rarely scratchy. Writing curves is exceptionally smooth and easy, while lines take a slight amount of effort. The pen has the option of taking Waterman cartridges or a Waterman converter. Made in France, the Waterman Expert is a wonderful choice whether as a gift for any holiday or a gift to oneself as a dependable but smooth everyday writer. - Babak - Pen Boutique Ltd, Montgomery Mall Store.